Have You Ever Been Electroporated? Join Jason Hartman as he interviews The Ultimate Zapper inventor, Ken Presner, about an interesting alternative to healing from many illnesses and diseases. Ken shares some of his story about his amazing recovery from Multiple Sclerosis and near fatal experience with Crohn’s disease. Ken was inspired by Dr. Hulda Clark, who invented the original parasite zapper in 1993, to invent a zapper that includes what is called the Electroporation Effect. This type of therapy enhances the body’s cells’ uptake of medicine and vitamin and mineral supplements. Ken discusses the different types of therapeutic benefits achieved through zapping, from maintaining health in a healthy person to ridding the body of parasites, bacteria, fungus and toxins, even cancer. Every person’s body contains parasites and many parasites, bacteria and toxins may eventually affect the body’s pathology. Ken also covers some of the scientific research, explaining frequencies and the destructive or healing effect of various frequencies. He also addresses issues with the FDA, mercury fillings, and the importance of recognizing the root of pathologies, whether they are metals or chemical. Ken Presner was born in Montreal, Canada. He received a B.A. from York University in Toronto in 1970. He was paralyzed by Multiple Sclerosis in 1989 and nearly died from Crohn’s disease in 1994. Both of these so-called incurable diseases were caused by mercury poisoning from silver amalgam fillings that are, in reality, 50 percent mercury. It took Ken nearly seven years to recover his health. He has written a book about his recovery, entitled My Recovery Protocol. His book tells his story and gives all the details of what he did to recover his health. Ken invented The Ultimate Zapper in 1996, based on the design of the original parasite zapper that was invented by Dr. Hulda Clark in 1993. The Ultimate Zapper is a unique device, radically different from Dr. Clark’s zapper. It is based on the principle of resonance and incorporates features that create a powerful synergy that helps people recover from a wide variety of illnesses, conditions and diseases. It also helps revitalize cells, organs and bodily systems. Through research and many studies, Ken Presner developed The Ultimate Zapper to produce blood electrification, which is patented for killing HIV, and electroporation therapy, both of which are U.S. government approved. Ken introduced his newest zapper, The New Model SE, in May, 2010, which is deemed the most powerful zapper available. It is based on the principle of resonance and incorporates features that create a powerful synergy that helps people recover from a wide variety of illnesses, conditions and diseases. The Ultimate Zapper helps revitalize cells, organs and bodily systems. Ken’s website is the most-visited zapper site in the world and The Ultimate Zapper is the best-selling zapper in the world. Jason Hartman: My pleasure to welcome Ken Presner who is coming to us all the way from Southeast Asia today. And he is the inventor of The Ultimate Zapper. So we’re going to talk about health – we’re going to talk about blood electrification and what that’s all about in terms of parasites, viruses, fungus, even cancer. Ken welcome, how are you? Ken Presner: I’m doing great. Thank you for having me. Jason Hartman: My pleasure. So tell us a little bit about The Zapper. I have to be honest. It sounds a little gimmicky, the name. And I’m sure people have told you that before, but there’s apparently a lot of science behind this, isn’t there? Ken Presner: Yeah, no people haven’t said it’s gimmicky because people who look for Zappers are aware that the name was created by Dr. Hulda Clark back in the 1990s, who invented the original Zapper, not the Ultimate Zapper. It’s a catchy word, yes. Gimmicky, I haven’t heard that before. Jason Hartman: No problem. No need to explain too much there, I just kind of thought I’d start off with that. So you were affected with what? Multiple Sclerosis? Ken Presner: No I wasn’t affected, I was paralyzed. Jason Hartman: Wow. And what was your evolution? What did you do, how did you come to be involved with this and invent this product? Ken Presner: Well it’s quite a long story. I was paralyzed and bed ridden in 1989 with Multiple Sclerosis. And I nearly died from Chrome’s Disease in 1994. I came to invent the Ultimate Zapper in 1996 after reading Hulda Clark’s book The Cure for All Diseases and doing some of the things that she recommends in her book. It’s quite a story. I don’t know how much detail you want to go into, but suffice to say that my interest in electronics goes back to the 1950s. And I had great sense of motivation when this , if you’ll excuse the pun, sparked my interest because I saw that what Dr. Clark was saying was absolutely spot on about detoxification, about parasites, which I had been diagnosed with, detoxification, I had been diagnosed as being toxic as well. And when I saw that what she recommends gave very astonishing and very quick results, as I say, I was sparked by her invention of The Zapper to go further. Jason Hartman: And what does it do? Ken Presner: The Ultimate Zapper kills a variety of pathogens, parasites, bacteria, fungus, yeast, and it also has a very powerful electroporation effect, which creates a temporary porosity in the cells. This allows nutrients, vitamins, minerals, and herbs to enter the cells much more efficiently which can be very beneficial. In the case of medication, it will also allow medication to enter the cells more efficiently, in which case dosages have to be adjusted and doctors have to be consulted. Jason Hartman: And how does one use it? Ken Presner: Well the instruction page is right on my site. The Ultimate Zapper comes with two hand holds, and it comes with optional foot pads. It’s very easy to use. You cover them with paper toweling or light cloth coverings, just cotton. Dampen it. Sometimes people use salt water to increase the conductivity. And you turn the switch on and hold on to them basically. You can apply them at two different areas of the body. I have suggestions on my instruction page. And you can also use the foot pads to great advantage. People also use them for zapping their pets. And I have a testimonial with 458 unsolicited testimonials. And there is a section on pet zapping, and some people have gotten amazing results for their pets as well as themselves. So that’s on my site, and people can read that at their leisure. I have the largest zapper website in the world. It’s about 20 megabytes, although I sell only my zapper there’s a tremendous amount of health information on my site. Jason Hartman: And does it hurt? Ken Presner: No, no it doesn’t hurt. Most people don’t feel anything at all because the frequency that The Ultimate Zapper is set to is 2,500 hertz which means that there are 2,500 pulses per second. Unless you’re very, very sensitive, you won’t feel a thing. In fact some people say I don’t feel anything, and I say well that’s normal. Some people feel a little tingling, small sensations and that’s pretty well it. Jason Hartman: So it’s an electrical current? Jason Hartman: Contrast the difference between this and electrical muscle stimulation, where people use that for rehab and recovery from muscle injuries and so forth. Ken Presner: Yes, there are tinge machines and devices that are used that have different specifications. They’re not at all the same as The Ultimate Zapper. They do not do the same thing as The Ultimate Zapper does. The Ultimate Zapper is designed to produce what is called a positive offset square wave. The wave is stabilized. The voltage is constant because it is powered by an AC adapter so you don’t have the same problems as you have with battery zappers that discharge. If you read my home page and if you read my FAQ page, it will describe in detail for you the technical aspects and also the therapeutic aspects very clearly. The therapeutic benefits are many and varied. There are about 12 health categories on my site in the testimonial archive. And although I must say that it is illegal for me to make any medical claims, I can only give my opinions and everything is anecdotal. Otherwise, there’s a problem. So that having been said, if you take a look at the testimonial archive on my website you will see that people have benefited from using The Ultimate Zapper for everything from, what one would call the minor ailments, the cold, the flu, pains and aches of various kinds, to very serious conditions. Conditions such as various cancers and various blood conditions such as HIV, lime disease, serious gastrointestinal problems, very serious parasitic infestations, problems in the urogenital system. There are seventeen categories now in the testimonial archive. Jason Hartman: And how often does one use it and for how much time? What is a session like? Ken Presner: Well this is a very good question. Now, Hulda Clark years ago, when she invented her zapper, she created what’s known as the famous Hulda Clark cycle. Which is 7 minutes on, 20 minute break, 7 minutes on, 20 minute break, and a final 7 minutes on. Well that was appropriate for her zapper because her zapper was a very simple one. If you consult the 5 zapper comparison charts on my site that compare 29 zappers, including The Ultimate Zapper, you’ll be able to see her zapper. It’s the A-6. And the A-6 was a simple zapper and you needed a full 7 minutes in order to get results. But one of the reasons why I invented The Ultimate Zapper was that the results that I got and that other people were getting with the A-6, the original version were sometimes there, sometimes not there, sometimes so/so. So with The Ultimate Zapper, you start off at 15 seconds. The reason is that The Ultimate Zapper is the most powerful zapper available. Many people only need 15 seconds to get the full therapeutic benefits. Many people are sensitive and they find that they start to experience detoxification symptoms such as what’s called the herxheimer reaction or other detoxification symptoms. If they zap very quickly at more than one minute. Let’s say they jump in at 7 minutes and they really should be at 15 seconds, they may Email me and say oh my gosh, I felt so unwell last night. I don’t know what happened to me. And I’ll say well how many minutes were you zapping? How long were you zapping for? And they say oh well I did the 7 minutes. I say well, stop for two or three days. Let everything die down and go back to 15 seconds and see how you do. And inevitably and variably Email me back and say thank you very much, it’s working for me now. So some people, and then I recommend on my instruction page for people to work up very slowly. Go from 15 seconds to 30 seconds. Every few days you can add a half a minute or a minute. Some people can ramp up very quickly to 7 minutes. Some people zap 7-10 minutes with no problem right off the bat. Other people like to do what’s called duration zapping, which is zapping for 15 minutes, a half hour, even up to an hour without any breaks whatsoever. So in other words, it’s not engraved in stone. Everyone has to find what I call their maximum level of comfort. People should not zap to the point where they are feeling discomfort or symptoms which are starting to concern them. They should zap to a level where they are comfortable and if they reach a level where they start to feel uncomfortable, they should pull back and be in a comfort zone. Jason Hartman: So it doesn’t take much time then at all, does it? Ken Presner: Well no. It really doesn’t. You can do this at your leisure in the evening or in the morning, depending on what your schedule is. Some people want to zap more than once a day but it just takes a matter of as I say, anywhere from 15 seconds to a few minutes. And then you’re done. Jason Hartman: And how often? Once a day? Ken Presner: Well there are at least two different categories here. For people who have specific conditions or ailments that they are zapping for, I recommend zapping at least once a day. You can zap up to three times a day and you can also take certain supplements if you wish to enhance the effect of certain supplements that you have, that you’re taking. You can take those within an hour of zapping and that porosity effect called the electroporation effect will kick in. this normally kicks in within an hour of either side of zapping. Jason Hartman: Now so a healthy person can use it to, then? Ken Presner: Yes. This is another category. People who are healthy but who want to maintain their health. Everybody has parasites. If you read the studies written by pathologists, the books and the medical literature, they say that the average is about two pounds per person that we are carrying in terms of parasites. So even if you are healthy, you do carry a load of parasites and they can become involved in pathology at some point in time in your life. So maintenance zapping can be done 2-3 times a week if you wish in order to keep the parasite load that we all naturally have down to a minimum and to keep yourself healthy, to keep your immune system strong as well. Jason Hartman: So is disease all about parasites then? Ken Presner: Hulda Clark said it is. Well she talked about toxins and parasites. I think that things are a little bit more complex than she talked about really. It’s hard to describe the whole thing because she created really a large mountain of work and research to talk about specifics of what I feel are correct things and what are incorrect will take some time. But I would from my point of view having been through two so-called incurable diseases, to cut to the quick, I believe that a lot of what we’re facing in terms of disease and serious illness, chronic illness certainly has to do with underlying mental and or chemical toxicity and then opportunistic pathogens that help make up the chain of pathology. Pathogens such as parasites, bacteria, viruses, yeast, fungus and the rest. Jason Hartman: And tell us about these parasites. There’s a documentary somebody recommended to me that I’ve been meaning to watch about parasites. And I just haven’t gotten around to it yet. What is a parasite, what does a parasite do to us, and I guess what does the zapper do to the parasite too? Ken Presner: If you read parts of my FAQ page about the principle of how the zapper works, it’s based on a principle called resonance. Now some people are not revising this in the light of some things, they’re followers of Hulda Clark, some of my competitors, and when Hulda Clark, she passed away in 2009 by the way, if she said something, they followed it. If she revised something, they followed it. They parroted it. From my experience it cannot be, no one even Dr. Hulda Clark could completely explain how this works. But what appears to happen is that there’s a resonance with the pathogens that kills them. If you go back years ago, there was a commercial on TV about Memorex tape. Is it live or is it Memorex? And I think it was an opera singer – she was singing a very high pitched sound. And a wine glass broke. Well why did the wine glass break? The wine glass broke because the frequency of the note that she struck was the same frequency as the natural frequency of the glass. Everything has a natural frequency in our world, in nature. And when the frequency is struck, then resonance happens and that resonance creates a destructive effect. So that is the short explanation of how the zapper works. Jason Hartman: What else should people know about it? Ken Presner: I think that the other important thing besides killing pathogens is the electroporation effect. This is something which other people, other zapper sites don’t really go into because their zappers don’t produce this effect. But The Ultimate Zapper does. The Ultimate Zapper creates an electroporation effect. It creates a temporary porosity in the cells, allowing vitamins, minerals, herbs, supplements to enter the cells much more efficiently, and medication. In the latter case, doctors should be consulted about lowering dosages. Now the benefit of this is very, very important. For instance, vitamin C kills cancer. The research by Dr. Linus Pauling who won the Nobel Prize and Dr. Irwin Stone, showed quite clearly that vitamin C kills cancer if you use The Ultimate Zapper when you’re taking large dosages of Vitamin C, within an hour or so, you can infuse your cells, flood your cells with a much more powerful vitamin C flow. And this can have a beneficial effect. There are many other conditions and ailments that one might want to target in a similar way. Therapeutically if you want to keep healthy, if you want to do maintenance zapping, if you take your supplements within an hour of zapping you can have a very positive electroporation effect that will help you to stay healthy if you’re not targeting specific conditions or illnesses when you’re zapping. So it’s multifunctional. The Ultimate Zapper has different benefits and certainly benefits that other zappers do not have. Jason Hartman: Talk to us for a moment if you would about supplements and supplementation. You were mentioning a moment ago that the zapper can make supplementation more effective? Ken Presner: Yes. I have a lot of experience in this area. I was in the health food business back in the 1980s. I saw an awful lot of supplements. 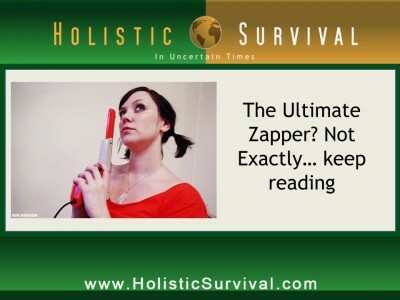 And The Ultimate Zapper has a very powerful electroporation effect that can enhance the effect of supplements and herbs that are taken within about an hour of zapping. So this is a very strong, a very powerful therapeutic effect. Jason Hartman: And within an hour…is that before or after? Does it matter? Ken Presner: Either way. The experiments show that either way. If you are taking prescription medication, is you have a serious illness and you’re seeing the doctor, and you’re on a very slow acting or very powerful medication, you should consult your doctor about lowering your dosage. Some doctors understand about the zapper – many of them don’t. But the ones who do have gone along and some have been amazed. There are many doctors who use my zapper. I’ve sold my zapper to many medical doctors and other practitioners over the years, and the ones who understand this can advise their patience what to do about the dosage. In some cases they might say well we don’t have to do very much. In most cases the doctor will say, if it’s a serious medication and strong medication, a long acting medication, they will recommend a lowering of the dosage because The Ultimate Zapper enhances the effect of the dosage. Announcer: What’s great about the shows you’ll find on JasonHartman.com is that if you want to learn how to finance your next big real estate deal, there’s a show for that. If you want to learn more about food storage and the best way to keep those onions from smelling up everything else, there’s a show for that. If you honestly want to know more about business ethics, there’s a show for that. And if you just want to get away from it all and need to know something about world travel, there’s even a show for that. Yep, there’s a show for just about anything. Only from JasonHartman.com. Or type in “Jason Hartman” in the iTunes store. Jason Hartman: Well first of all, before we get off the supplement discussion, are there any supplements that you would specifically recommend to the listeners? I know that’s a huge question and there are thousands of supplements of course. Ken Presner: Yes it is a huge question if you take a look at the shelves in your local vitamin store. Jason Hartman: Completely understand that. I completely understand it. It’s a loaded question that I asked. But just generally, anything for general health and longevity. Maybe there are a few recommendations. Ken Presner: Well there are some simple things that one can do. I do this every day. Vitamin C is the queen of all the vitamins, so if you take good quality vitamin C. I take an Ester C. If you take it with bioflavonoids, which is part of the vitamin C complex, I think that’s a good thing to do every day. It’s very important for killing various kinds of pathogens and helping keep a strong immune system. So I would say vitamin C is very good. A good vitamin B complex is very good for the entire nervous system, among other things. Those are two things that I feel are very important. Milk thistle is very important for protecting the liver and helping the liver detoxify. And the liver being the largest internal organ for detoxification, I say internal because the skin is the largest organ for detoxification and it’s not internal obviously – milk thistle is a very important supplement. And in terms of minerals, I think that one of the most important things you can take is magnesium. Magnesium, the complementary mineral is calcium and calcium creates the contraction of all the muscles in the body and magnesium creates the relaxation of all the muscles in the body, including the heart muscle. And so magnesium is known to be an excellent regulator of blood pressure and it’s involved in about 300 metabolic processes and it helped me greatly when I was trying to walk again. And I would deduce that I was magnesium deficient in those days because once I started to take it, it helped my mobility. And this was long before I started to get into the zapper area. So I think that magnesium all around is very important. People take calcium and magnesium supplements. It’s very easy to get calcium for most of our diets, and it’s very difficult to be calcium deficient, but we don’t get as much magnesium as calcium. The ratio is supposed to be two to one. And it’s very easy to be magnesium deficient. So vitamin C, vitamin B complex, Milk thistle, magnesium, just some of the basics. Jason Hartman: Okay, good point Ken. And is there a multi vitamin that can cover these or you really have to take them individually, like the Ester C, etcetera? Ken Presner: Well, the problem with multi vitamins is that you’d probably in order to get therapeutic dosages of these vitamins and minerals, you’d probably have to take a huge horse pill. And I don’t know any multi that’s made that will give you the kinds of dosages in these quality vitamins and minerals that I take myself or that I would recommend to my friends. So I think that in terms of cost and in terms of quality and in terms of therapeutic effectiveness, you’re much better off just picking and choosing what you need. And if you want to throw in a multi just to top things off, that’s fine. But I would target the most important vitamins and minerals in good therapeutic dosages and then if you want to throw in a multi for the minor things, go ahead. Jason Hartman: Fair enough. Just in closing here, I’d like you to give out your website and tell people where they can learn more, but I do have one more question for you. What is your website? Ken Presner: Well I have two websites. First of all, www.theultimatezapper.com, that’s my mirror site. My main site is zap.intergate.ca with no www in front of it. Jason Hartman: Talk to us if you would for a moment about the FDA. At the beginning of our discussion today you said that you can’t make medical claims, and I’ve had a few different people on my show talking about the FDA and all of its downfalls and so forth, and how you can’t put on a jug of prune juice what it does, otherwise you’re making a medical claim, which everybody on the planet knows what prune juice does. It’s not exactly a complex idea. It seems like a cartel that’s in bed with the American Medical Association and the Pharma companies just making it impossible for anybody to under the guise of consumer protection, to get the word out about potentially good products. Ken Presner: Well I would tend to agree with you. If you take a look for instance at the focus of one of my site and my recovery, which is the poisoning of people through silver amalgam fillings, which they’re not silver – they’re 50% mercury. You will be able to read on my site, on my ADA page and the big dental lie page about the ADA and the FDA being in bed with one another. So this is a very good question and it’s a very pertinent one because the question is who are they working for, and there doesn’t appear to be much doubt that they are working for big pharmaceutical companies and the medical and the dental industries to our detriment. This is a very serious problem because they have done everything in the case of dental mercury to support the ADA. The Moms Against Mercury won a lawsuit against the FDA in 2008 on this very issue. The lawyer was a heroic lawyer named Charlie Brown who was on the Mom’s Against Mercury site. But in 2009 the FDA overturned their decision. It’s a no brainer that dental mercury is highly toxic. All the dentists are toxic. The medical literature shows that people that come to me show toxicity through various kinds of testing without any doubt as I did. The fact that this problem is not being addressed, and not only not being addressed but is being suppressed, is abominable. So this is all part of what you’re referring to and I could not agree more. Jason Hartman: In terms of the mercury fillings issue, there are two schools of thought on that issue. Some people say have them removed. Get them out of your body right away. Others say don’t disturb them. Leave bad enough alone, I guess. It’s sometimes worse to disturb them than it is to remove them. What are your thoughts there? Ken Presner: Well this is a very good point that you make. Your mercury fillings are a ticking time bomb because mercury vapor is leaching into the body 24 hours a day, 7 days a week. It’s been implicated in not only neurological problems but cardiovascular problems, gastrointestinal problems, you name it. So the question is what do you do if you have them? Well, what you do, what I did and what a lot of other people are doing is you have them removed by a mercury free dentist who is a specialist in this work, who will make sure that you do not inhale mercury vapors or pieced of mercury filling when the removal process is happening. If the work is done safely, and if chelation is done; chelation is the process whereby mercury is extracted from the organs and tissues and bodily systems. After the dental work is done, if you do those two things and some of the other things that I talk about in my recovery protocol, absolutely amazing recoveries can be seen. I have quite a number of them on my site and there are even more that I have not written up yet. So the key is to recognize the root of the pathology if you have a disease or an illness. If the root is established to be metals and/or chemicals, then there are ways to go about this safely that can remove risk even if you are not ill today, you may be showing symptoms, some may be not so serious, but in the future you could become seriously ill. And for mothers, this is a very, very important thing. Because mercury crosses the placenta and is in the brain and all of the organs of the unborn child. Hence Moms Against Mercury, the lawsuit against the FDA in 2008, hence all kinds of neurological problems that are associated specifically with children such as ADD and Autism, not to speak of Multiple Sclerosis in adults and all kinds of other neurological illnesses such as Alzheimer’s, Parkinson’s, ALS, etcetera. Jason Hartman: Is there a lesser thing? For example can one do chelation without having the fillings removed if they’re just too afraid to disturb them? Ken Presner: If you do that, what will happen is you will leach the mercury from your fillings into your brain and into your other organs, especially the kidneys, gastrointestinal track, and you can become severely ill if you do that. The short answer is never do chelation until all of the mercury is out of your mouth. You will put your health and your life potentially seriously at risk if you do so. Jason Hartman: Wow, okay. Good that I asked that question. And is it 100% that those mercury fillings are leaching, or I guess maybe the question is how can someone get tested for mercury toxicity? Ken Presner: If you have mercury fillings in your mouth, you’re mercury toxic. The government worries about fish. Fish are not two inches from your brain and they do not contain 50% mercury. If there was a fish that was sitting two inches from your brain, for some reason, and contained 50% mercury, I’m sure the government would be talking about it. Fish contain parts per million. Your fillings contain 50%. That’s a half a million per million, not parts per million. Parts per million are parts. That’s a fraction of one part per million, or possibly a little bit more than one part per million – half a million per million. I mean we’re talking about the most potent neurological poison in the world. Mercury is the strongest neurotoxin in the world. And the leaching, you asked about the leaching. This research has been done by Dr. Murray Vimy in Calgary, Alberta. So Dr. Vimy and others have done research as well into this and into chelation. There’s no question about the leaching of mercury 24 hours a day through various pathways into the brain and into the gastrointestinal tract and into the kidneys, through all the bodily systems and organs and tissues. This is not in doubt. What is in doubt is that the so called authorities are protecting those who are involved in creating a toxic population. They have licensed the use of dental mercury and they have done pretty well everything they can to protect the ADA and dentists from legal liability and they have acted against the best interest of the patients. In fact if dentists mention the word mercury they can have their license revoked. Well I wonder why. Everything possible is done in order to deny the fact that one of the most powerful toxins on the planet that is sitting two inches from the human brain is poisoning not only the brain but the rest of the human body. Now logic is turned on its head because what they’ve done is try their best to prove that an incredibly powerful toxin is not toxic. So go figure it out. It’s a no brainer, excuse the pun. I’m sorry but it’s a no brainer. It’s amazing. It’s unbelievable. Jason Hartman: Now they’re not using mercury anymore, are they? Ken Presner: Yes they are. They certainly are. Jason Hartman: They’re still using it. Ken Presner: Oh yes, they certainly are. I think that in America, if people are involved in let’s say, people from the military or people who are covered by public health, if they go to the dentist, I believe mercury is still being used. I think it’s being used outside of those cases as well. Change has happened not by the acknowledgement of mercury as an incredibly powerful toxin, the most powerful neurotoxin on the planet I will state again, but this is a very serious issue that has yet to be addressed, it has been dealt with essentially on the basis of esthetics. People come in and the doctor says oh you would maybe look nicer with white fillings. Or the customer, the client, the patient comes in and says I would like some white fillings. Nobody mentions the word mercury and the work if it’s done, which is mostly the case. Most dentists are not biological dentists, they’re not mercury free dentists, so most of the work is done incompetently and the doctor and the patient are far more mercury toxic because there is not a special mercury filtration system as with mercury free dentists. So you see, it’s a multi-faceted problem. There are many different aspects to this that one must understand in order to make informed choices. Make the best choices for you and your family. Jason Hartman: Well, Ken this has been very enlightening. Thank you so much for the information today and keep up the good work out there. And by the way, I just wanted to have you mention, how many people in how many countries are using The Ultimate Zapper? Ken Presner: Well there are many, many thousands of people who are using The Ultimate Zapper. It’s been on the market since 1996 and I came out with the new model, se in 2010 which is 40% more powerful than the original ultimate zapper and it is being shipped to over 60 countries. And I have a worldwide network of distributers. It is the bestselling zapper in the world. Jason Hartman: Great. Well very enlightening, very interesting, a lot to be concerned about out there. And really what amounts to defending ourselves against these toxins that are just part of big business and the corporatocracy and its fascist links to our government. It’s quite amazing. Ken Presner: Well there are a lot of different aspects and it would take a lot longer than an hour to go through everything but the bottom line is everybody has to realize that if they trust others, then others may or may not be making the best decision for them. If they are in the hands of a good practitioner, then they are very fortunate and they are on the right track. But if they are as I was back in 1989 at the beginning of a journey to search and find answers, you really have to do your own thinking and make your own decisions and the best way to do that is to become informed. Jason Hartman: Yeah. Good point. Ken Presner, thank you so much for joining us today. Appreciate it. Ken Presner: Thank you so much for having me. It’s been a pleasure. Narrator: Thank you for joining us today for the Holistic Survival Show. Protecting the people, places and profits you care about in uncertain times. Be sure to listen to our Creating Wealth Show, which focuses on exploiting the financial and wealth creation opportunities in today’s economy. Learn more at www.jasonhartman.com or search Jason Hartman on iTunes.